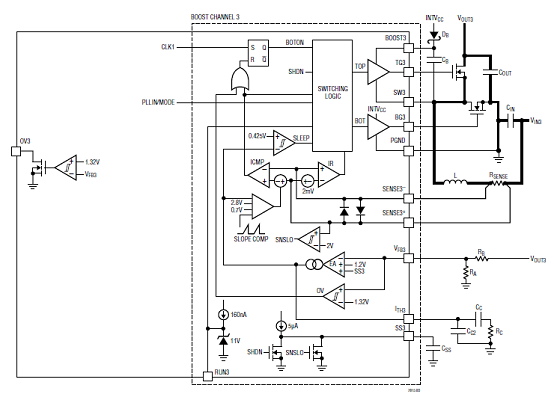 The LTCR7815 is a high performance triple output (buck/buck/boost) synchronous DC/DC switching regulator controllerthat drives all N-channel power MOSFET stages.Constant frequency current mode architecture allows aphase-lockable switching frequency of up to 2.25MHz. 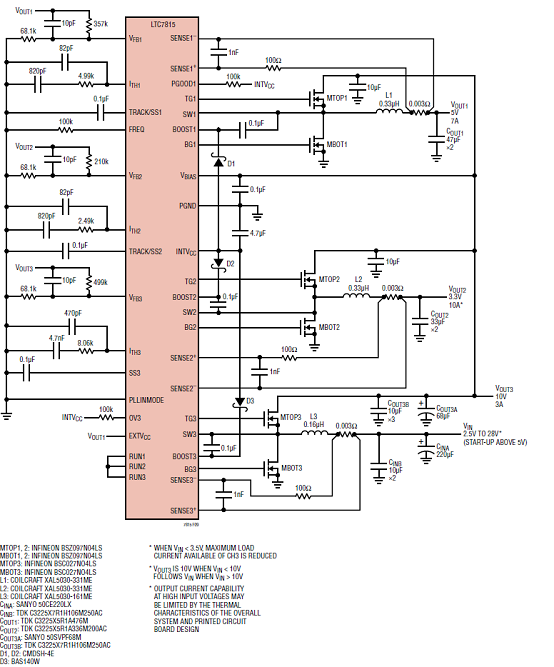 The LTC7815 operates from a wide 4.5V to 38V inputsupply range. When biased from the output of the boostconverter or another auxiliary supply, the LTC7815 canoperate from an input supply as low as 2.5V after start-up. 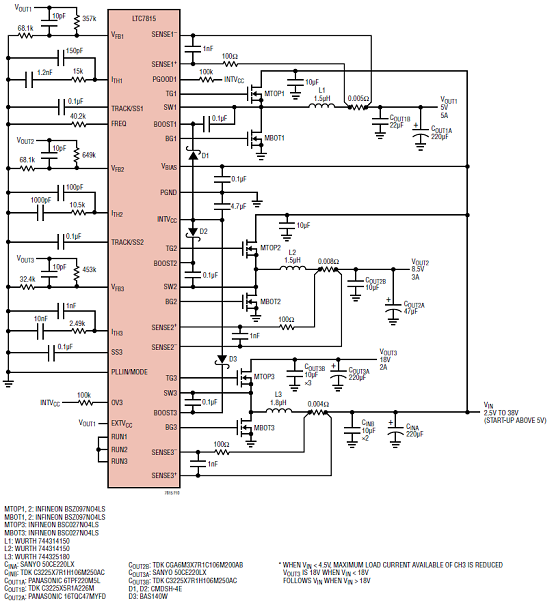 The 28μA no-load quiescent current extends operatingruntime in battery powered systems. OPTI-LOOP compensationallows the transient response to be optimizedover a wide range of output capacitance and ESR values. 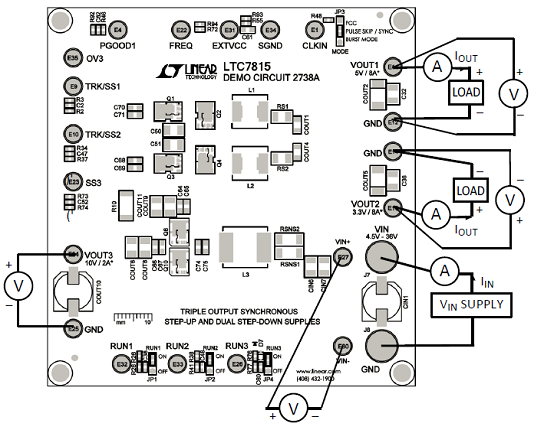 The LTC7815 features a precision 0.8V reference for thebucks, 1.2V reference for the boost and a power goodoutput indicator. The PLLIN/MODE pin selects amongBurst Mode operation, pulse-skipping mode, or continuousinductor current mode at light loads. 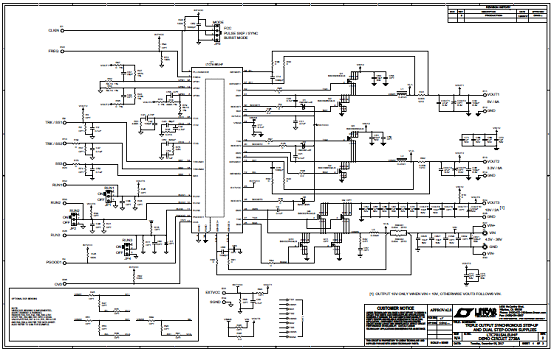 Demonstration circuit 2738A is a triple output synchronousstep-up/dual step-down supply featuring theLTC®7815. 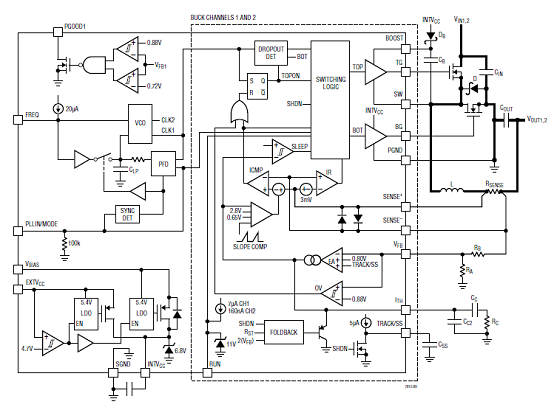 The demonstration circuit is designed for twobuck 5V/8A, 3.3V/8A outputs supplied by a boost 10V/7Aoutput. 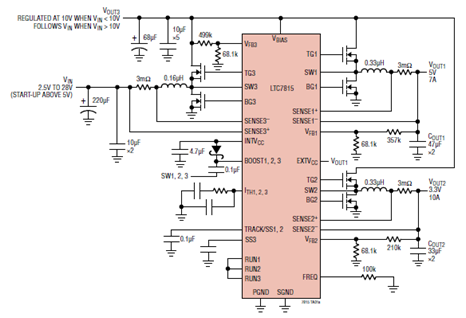 Benefiting from this feature, the buck outputs areable to maintain regulation over a wide input voltage rangeof 4.5V to 36V which is suitable for automotive or otherbattery fed applications. Also, the demonstration circuituses a drop-in layout that the main buck circuit componentsfit in an area of three-quarter inches by 1.5 inches,while the main boost circuit area is three-quarter inchesby 1.75 inches. 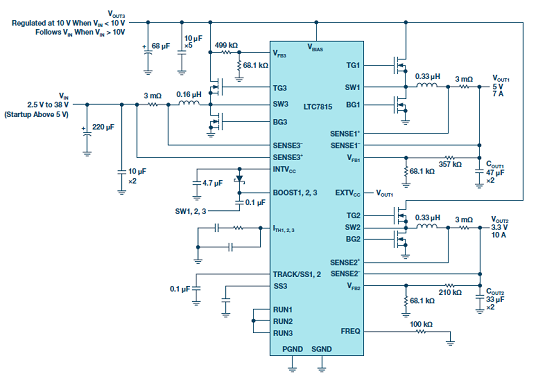 The package style for the LTC7815 is a38-pin exposed pad QFN. The main features of the board include rail tracking (buckchannels only), an internal 5V linear regulator for bias,separated RUN pins for each output, a PGOOD signal (CH1only), an over voltage indicator for CH3 and a mode selectorthat allow the converter to run in CCM, pulse-skippingor Burst Mode® operation. Synchronization to an externalclock is also possible. 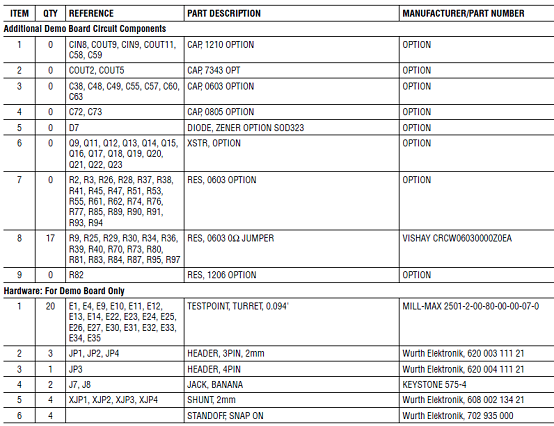 The LT7815 data sheet gives a completedescription of these parts, operation and applicationinformation. 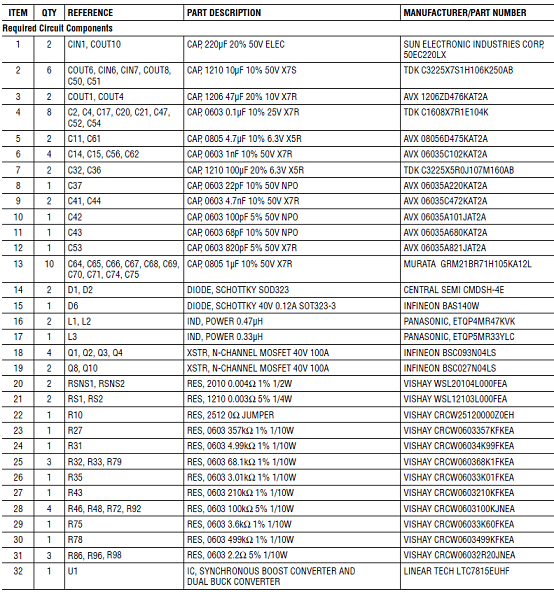 The data sheet must be read in conjunctionwith this quick start guide for demo circuit 2738A.